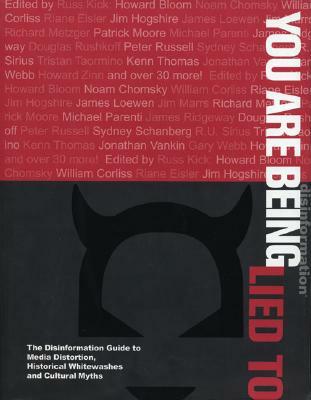 "You Are Being Lied To" is a massive collection of articles that ruthlessly destroy the distortions, myths, and outright lies that are fed to us by the government, the media, corporations, history books, organized religion, science and medicine, and society in general. No one is spared, and all sacred cows are candidates for the grinder. * Alcoholics Anonymous is effective. * Hackers pose a grave threat to the nation. * There's a hidden code in the Bible. * The Big Bang is an airtight fact. * Thousands of species have gone extinct because of deforestation. * Licking certain toads will get you high. * Most terrorists are Middle Eastern. Wake up You're being lied to. This book acts as a battering ram against the distortions, myths, and outright lies that have been shoved down our throats by the government, the media, corporations, organized religion, the scientific establishment, and others who want to keep the truth from us. An unprecedented group of researchers--investigative reporters, political dissidents, academics, media watchdogs, scientist-philosophers, social critics, and rogue scholars--paints a picture of a world where crucial stories are ignored or actively suppressed and the official version of events has more holes in it than Swiss cheese. A world where real dangers are downplayed and nonexistent dangers are trumpeted. In short, a world where you are being lied to.